Contains an average of 3% curcumin and 3.5% cracked black pepper to aid maximum absorption. It is also recommend to feed with Global Herbs Flax Oil for optimum results. Better known in English as Turmeric, Curcuma is traditionally used to dye silk and woollen Buddhist robes their orange-yellow colour. Below are some recent questions we've received regarding Global Herbs Turmeric, including answers from our team. what is the dosage for a cob pony? The average dose for a cob is between 1/2-2 scoops and for smaller ponies between 1/2-1 scoops. I have been told that the pepper needs to be FRESHLY ground to have any effect. Would you be able to shed any light on this please? Thanks. As far as I am aware the pepper does not need to be freshly ground. The compound in black pepper, Piperine, which allows the body to utilise more Turmeric is present whether the pepper is freshly ground or not. The reason freshly ground pepper is suggested is because you will just be receiving peppercorns rather than pepper with other spices which can happen when you purchase pre-ground pepper. The pepper in this supplement is cracked black pepper only. There is no clinical evidence to suggest Turmeric can lead to anaemia though equally there is no clinical evidence to say that it doesn't. 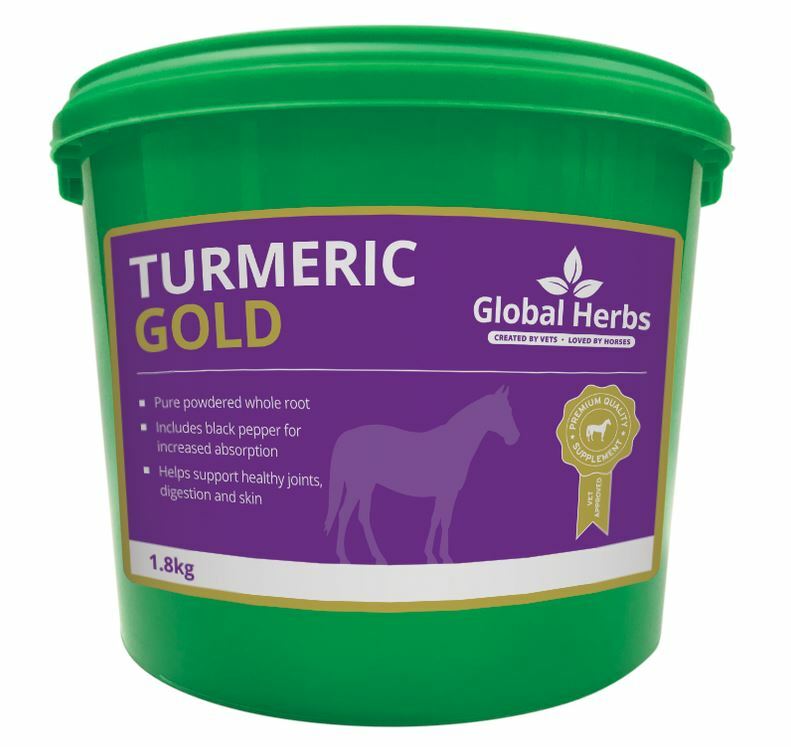 However, many horses take Turmeric daily long term without any problems so I wouldn't be too concerned about this. I am looking for a turmeric supplement for dogs and wondering if the equine products can be used on canines. Where the sole ingredient is turmeric then I don't think it would do your dog any harm although it would be difficult to know what dose to give. However I wouldn't give this particular product since it contains black pepper which may cause a stomach upset for your dog. There are some very good dog joint supplements containing turmeric such as Seraquin, GWF Nutrition Joint Aid or our own Joint Force which you could have a look at. It is perfectly safe to give Turmeric alongside the bute. If she is very painful you could speak with your vet about increasing the dose of bute to 1 sachet daily as well as adding in turmeric. There is a concern regarding liver damage associated with longterm use of non-steroidal anti-inflammatories such as bute but often quality of life is the primary concern. Please could you give advice which product is potentially better... Tumeric or sarc ex for sarcoids. Horse has several sarcoids to face and sheath had chemo and laser surgery but two urs later they are back. Sarcoids seem to show a variable response to all these sort s of products so it is not possible to say which is better. Either of them might help, but again possibly neither will work and you might be looking at more treatment from your vet. You would need to try these products and see if they help your individual horse. I think that Sarc Ex would be my choice, but it is difficult to know. My horse is on Cortaflexion as well as Mud X and Flax Oil for his mud fever/skin issues. Can I feed him Turmeric as well as these other supplements??? Kindly advise. I must say your horse is lucky to be so well provided for! These supplements should all work well together including the turmeric, and I would not expect any sort of adverse interaction. (This has not been thoroughly tested scientifically so in one sense it is not possible to say with absolute certainty, but I am sure all will be well.